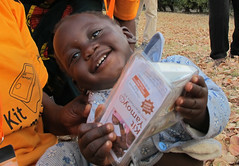 We continue to search for a practical SODIS solution that will work with an AidPod Mother’s Kit. 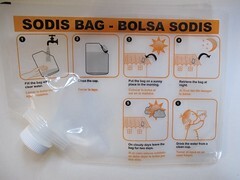 In a previous post I talked about making the AidPod itself out of PET so that it could be used as a measuring jug and as a mechanism for disinfecting the water to be mixed with the Oral Rehydration Salts (ORS) in the kit. However, initial enquiries indicate that it would be too expensive to ‘tool-up’ to produce a PET AidPod for the planned pilot and so we are looking for other solutions for the pilot phase. In this respect we have received excellent support from the SODIS Team at EAWAG (Aquatic Research) in Switzerland who have sent samples of a prototype SODIS bag they have been working on. 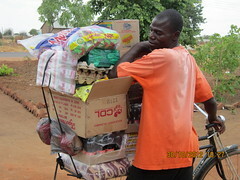 Although this bag needs some modification it would fit into an AidPod and would be an option for the ColaLife Pilot.